Given the number of productions of the (in)famous Lovecraft-themed parody of Fiddler on the Roof in recent years, it seems easy to assume every attempt was successful. Sadly that was not the case for what is said to be the earliest attempt due to it having never made it into the public view. I know what you might be thinking and, no, it was not just the people behind Fiddler on the Roof being litigious (although such issues have prevented other performances in the past). Let’s just say the events behind the cancellation of the Other Gods Theatre Company’s attempt at staging a production were far more…unusual. The H.P. Lovecraft Historical Society has put together a short film on the subject back in 2000 and has made it available for free online. Said film is available on the H.P. Lovecraft Historical Society website and you’ll need Quicktime in order to play it. If you don’t have it, you can download the player here. Since sources online differ on whether this is actually a documentary or mockumentary, you’ll just have to watch and decide for yourself. If that isn’t enough of a hook for you, let’s not forget how Chris Sarandon and Stuart Gordon appear in it! But that’s not all! 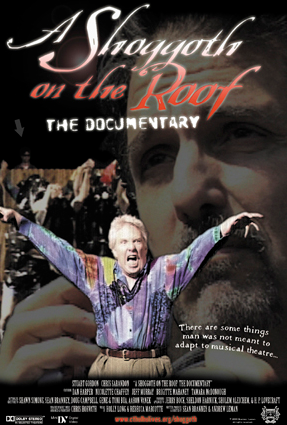 Their website also offers numerous audio and script samples from the play, including a free download of the track “Byakhee Byakhee.” If you want a high quality version of the film, then you should definitely pick up the combo pack containing a DVD of the film, the play’s soundtrack CD and libretto. Alternately, you can purchase the album and libretto separately. UPDATE: The H.P. Lovecraft Historical Society has moved to a new URL! Sadly this means most of the above links are broken and some of the offers mentioned above are not currently available. Only the cast album is currently available for purchase at this time, but I will update this page when and if the other portions are restored. Special thanks to the H.P. Lovecraft Historical Society for use of the image!